Thomas Leemans appears to have no existence independent of the presence of a spreading expanse of calms. In his note on Leemans Mr Cockett comments that of "seventeen pictures seen by the author over the last twenty years only one was signed. 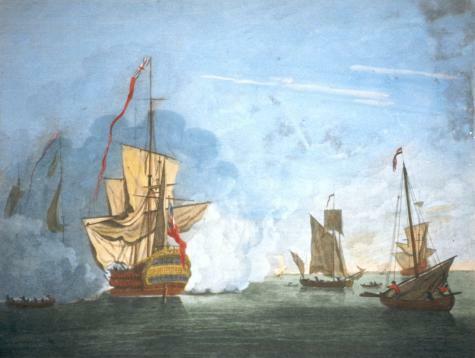 All seventeen were flat calms and were fairly identical compositions -- stern view of a major ship, possibly a small 'hoy' beached in the foreground." By my reckoning, following Kingzett, Scott authentically painted a tally of 19 flat calms. There is no connection. I estimate that by now there are least 16 paintings credited to Leemans on this website. There does appear to be some connection, however, unless I'm completely adrift, between the print published in 1803 by Laurie & Whittle, above and below, ascribed to Scott, and the works (only one known signed) of the ghostly Thomas. That sentence was written in 2003, and I'm now, in 2013, obliged to admit that I might have been completely adrift. The original oil, mentioned below, has appeared on the internet, and while I doubt that it is by Scott, I equally doubt that it is by Leemans --- if such a person ever was. The picture by Leemans, below left, reminded me of the print after Scott, above, engraved by Morris, 1803, here reversed, left. 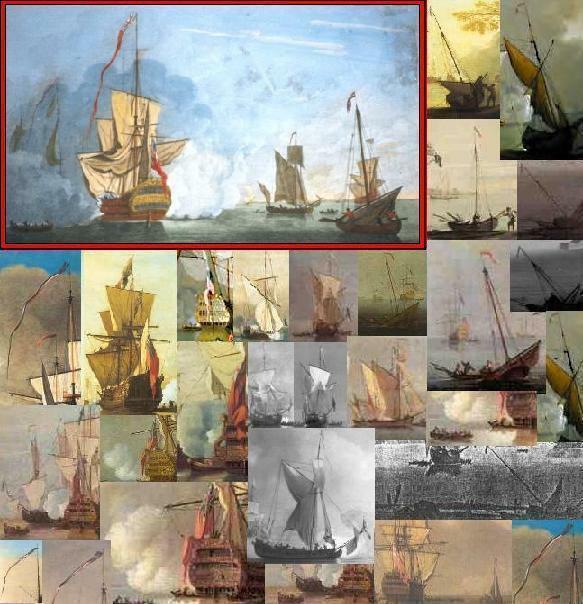 At first it was the elongated crossyard which seemed familiar, but then the vessel almost obscured by the puff of smoke, here on the right, recalled the compositions repeated ad nauseam by Leemans, as can be seen here, here, and here. Version E is set next to the Scott print, below. Laurie & Whittle are not totally trustworthy, but guessing would cease if there were an authenticated oil by Scott matching the print. Perhaps the City Art Gallery, Plymouth, has such an original; see Kingzett, picture T, p 23. Left, version E, previous page; right, print after Scott, 1803 . Aids to research, such as signatures and prints, are double-edged. Anyone who can paint a picture can paint a signature. Print inscriptions depend on the integrity of print-makers, publishers and dealers. Kirkall, Houston, possibly Boydell, and certainly Laurie & Whittle were demonstrably cavalier in their ascriptions. Still, I believe the prints issued after Monamy by Bowles in 1745/6 are a helpful guide to his genuine oeuvre. Fiddle with the scroll to form an impression of his output, based on this print legacy, and decide whether it matches the lack of variety and meticulous devotion to calms which is imputed to him by the many, or the sensitivity and agitation imputed to him by the few. I no longer believe that the oil signed Monamy, and perhaps not the print after Scott, at left, are by these painters. In fact, I think they could both be by Leemans, for want of a better name. 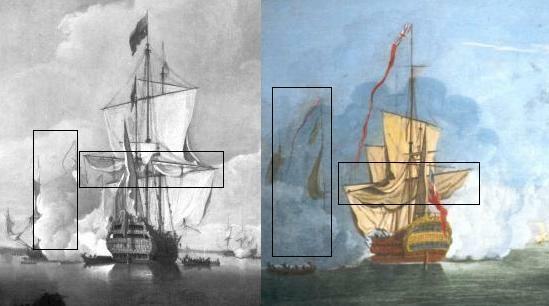 Details 1 (mezzotint) and 3 (line), above, are the only print evidence for Monamy's repetition of what we are calling the Royal Sovereign type of ship view. Detail 2 is an almost exact copy, in reverse, of the mezzotint detail 1; see the marine genre pattern booklet here. Detail 4 is from the hand-coloured line print heading this page. Detail 5 is the oil, discussed above, signed Monamy, or bearing his signature. If a line print is engraved after an oil painting, or another print, it will nearly always be in reverse. An exception is Parr's engraving after Monamy's painting of the capture of Porto Bello, see Vauxhall Gardens, here. If an oil painting is based on a print or a mezzotint it will almost certainly not be in reverse. Sometimes an oil painting may appear to be based on a print, in reverse, but in fact is following an earlier original oil. If a mezzotint follows an oil painting it may or may not be in reverse. Most, or all, of Kirkall's mezzotints after van de Velde are in reverse, but most of the mezzotint portraits of John Smith and John Faber are in the same sense as the original oil --- eg Thomas Stubley's portrait of Monamy, engraved by Faber. This is a loose guide to the originality or otherwise of an oil painting, when comparing it with a closely similar or obviously related print. left: print, reversed. 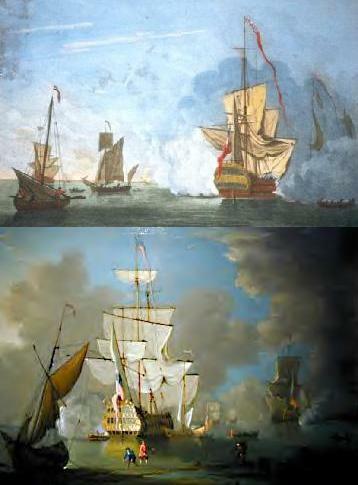 right: oil painting in city art gallery, plymouth. probably unsigned. A Calm by Samuel Scott. Oil on panel, 11½ x 15. Collection: Plymouth City Council: Museum and Art Gallery. the stern of the vessel in the print has been "moderniz'd". See Joel, page 119. No 10; 14½ x 19¾, signed Brooking. Not the same, but similar.